A lone warrior wandering the rugged wilderness, a tall watchtower looming in the background. The Six Lakes sky landscape from Landscapes Unlimited provides the perfect backdrop for showing off the Immortal Elf outfit from Noble Creations and the Chillon Tower from Fanatik looks right at home amidst these tall mountains as well. There is a new round of the Epiphany on, which means elaborate gacha sets that you can either try your luck on OR in some cases buy as complete sets. The set from Chandra Meehan of deviousMind is called Azumi and described as “assassin silks”, which put all sorts of ideas into my head for how to photo it! I rather like what I ended up with, though I did have to use the skirt-less option of the dress for it to work with the first pose. But I think it really shows off the fabulous leather braces with their attached blades in a great way. Dreaming Thicket has a new gown out at We Love Role-Play, this time inspired by Viking and early medieval gowns. It is a simple style that comes in earthy colours that look warm and comforting during the winter season. I used a few pieces from Nomad’s Midgard gacha to setup the scene of an early winter morning in a wooden house with a central fireplace and some simple furnishings. The hair is a favourite from Stealthic which looks great in red, the freckled skin is from alaskametro and the head is one of my LightStar heads, Marian. Before sending me this outfit, Chandra Meehan of deviousMind asked if I was up for it, given what I said in my last post about spiders. I assured her that as long as the spiders weren’t animesh and crawling all over me, I would probably be fine. That said, there are a lot of spiders in this outfit! And I am not even wearing all of them here; there are a few more flexi add-ons, some applier layers (with or without blood) and some other hair/head ornaments (with spiders, of course). Additionally, there’s a nice accessory available for the Once Upon a Nightmare hunt. After debating it for a while, I recently picked up the Axis HUD from LeLutka. With this HUD you can make your own expressions for your bento mesh heads and no, it doesn’t just work on LeLutka. In this video, I demonstrate the HUD on three different heads: LeLutka Cate, Vista Zoe and Lightstar Maya. Full credits for what I am wearing can be found at the end of this post and I have also included two photos to show the outfit from On a Lark and the jewelry from the Plastik better. When I browsed through the newly opened September round of We Love Role-Play, I was thrilled to find the new jewellery set from Bliensen + MaiTai. It is a beautiful replica of an actual Minoan pendant, showing two bees storing away a drop of honey. The actual Minoan piece is one of the most celebrated pieces of Minoan art, a beautiful example of their skill at working with gold. I saw it in the museum in Herakleion when I visited Crete (sadly ages ago!) and of course I bought a silver replica to take home. I really enjoy being able to get it in Second Life as well and I would love to see more historical replica jewellery! A short while back, I featured the Ladies’ Crowns gacha from the Dreaming Thicket. Now there is a matching Lords’ Crowns gacha out at Enchantment, which is also where you will find the Prince Lawrence outfit from Noble Creations. 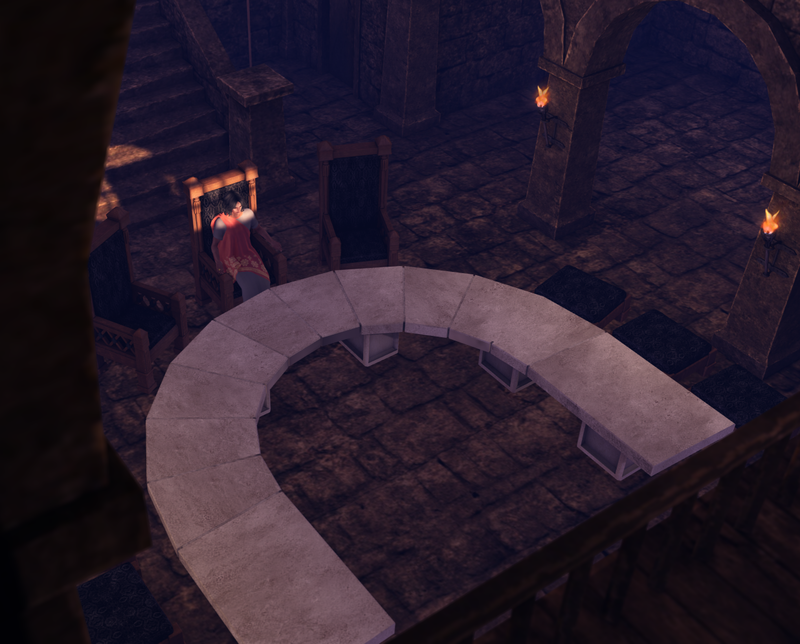 I didn’t go for any frogs in this scene, but rather setup a scenario of a King in Waiting standing beside the throne, waiting his turn. I am still making my way through the LightStar heads and today I have Makeda to show you, a head with African features. As with all of the other LightStar heads, there’s a “companion” male head, in this case called Solomon. I do hope to show some more of the male heads as well but if it is a bit tough to find Omega skins for female heads it is 10 times worse for male heads. It may just have to wait for Bakes on Mesh to go live; in fact, I have tried several of these heads with some system skins in the project viewer and they work beautifully. In this post I am also showing you the Maxwelle Chaise from the Plastik, the Fortuna bodysuit from Voluptas Virtualis and the Brooklyn hair from Wasabi. Anyway, I wanted to get another Vintage Fair post out before it closes and since I also have a few more LightStar heads to show off, I decided to do both at the same time. Today’s head is Lin, one of the more distinctly ethnic heads from the range, and like all the other heads it is now down to just L$1000. I am wearing it with an Asian-inspired skin from Alaskametro and a Chinese-style gown rom Senzafine. The gown and the shoes (by Eclectica) are from the Vintage Fair, as are the poses by An Lar used for these shots. The final weekend of the Vintage Fair is coming up and I thought I would show another favourite item from it, namely the striking High Council set from Roawenwood. It is perhaps a little more vintage than most, but certainly right up my alley. I knew I had to blog it as soon as I saw it and I love how it looks in the build from Fanatik’s Medieval Village set. 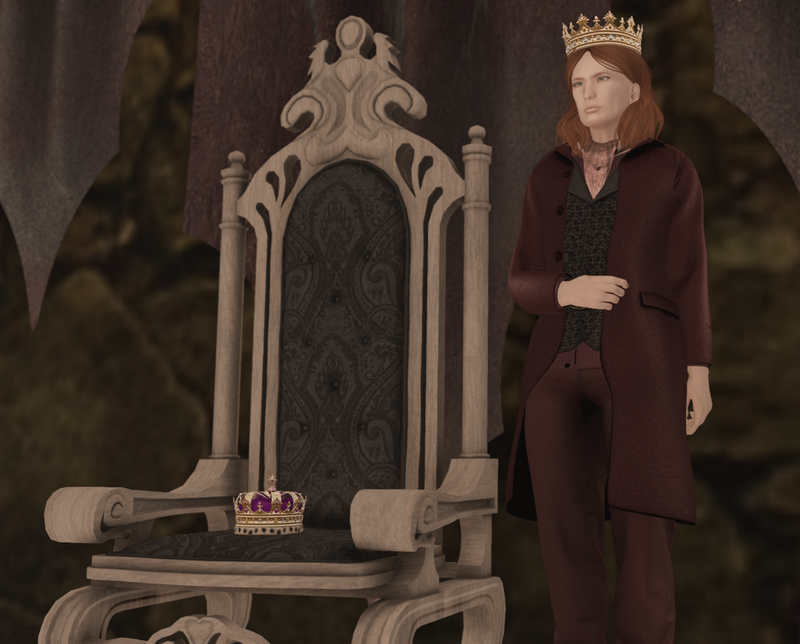 To play the part of the lonely ruler, I opted to switch to a male avatar, which also gave me the chance to show off one of the male heads from LightStar as well as the male version of the Elvenne skins from the Plastik. Lootbox is opening today and I am giving you a taste of two new releases you will find there, from deviousMind and Luxuria. As usual, the Lootbox gacha will include lootbox rares that offer things like whole item sets, special item sets and so on, rather than just single rare items. I’ve paired the Lootbox items with a new hair release from Wasabi and a skin from the massive new skin collection at the Plastik. I also want to give everyone a heads-up about a price reduction for some of my favourite mesh heads, namely the LightStar heads.